Aminata and I had met for the first time at a barbecue given by common Cameroonian friends in the suburbs a few weeks ago. While driving her home, at the request of our hosts, I learned that she had been living in the Bordeaux area for a year. Born in Côte d'Ivoire, Aminata, better known as Amy, has completed solid accounting studies in Abidjan. Still very young, she had a first opportunity to work abroad when a participation in a professional exchange program in France was offered to her by an international counseling firm. During that stay, she missed her family a lot and called her mother frequently. 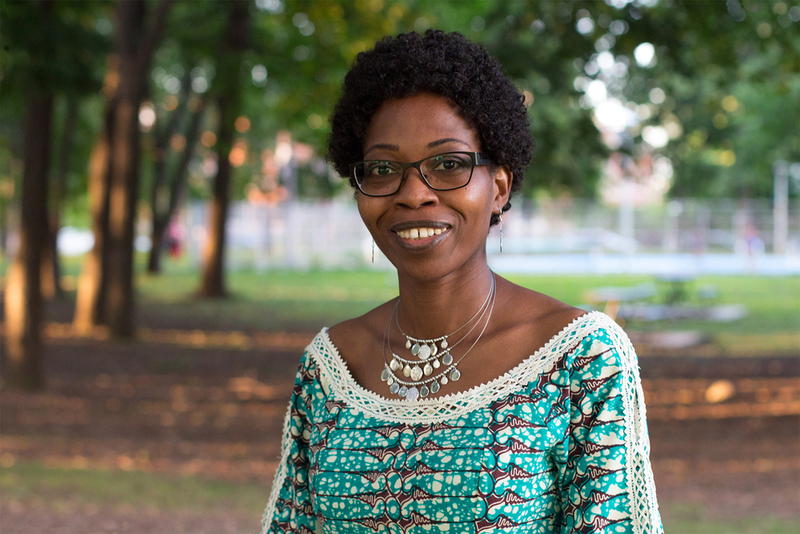 Back in Côte d'Ivoire, the outbreak of the national crisis pushed her to undertake immigration procedures to Canada. However, the crisis, which got worse in 2004, lengthened the procedures to a full five years. Her arrival in Montreal was difficult. The recognition of her diplomas dragged over nearly a year. Conscious of her competences, she did not want to start at the bottom of the ladder. At one point, well-meaning employees at an immigrant assistance center even suggested that she erase most of her CV in order not to seem too skilled. This, to her, amounted to a lie, in addition to self-devaluation. It is via a detour in Alberta that she managed to acquire her first professional experience in this country. Equivalencies of diplomas were granted to her within a month in that province! Because of a stronger attachment to Quebec, she returned here after a year. One of her brothers has since joined her in Montreal, while her sister and another brother are still in Côte d'Ivoire. With a better knowledge of English and a Canadian work experience, she was able to make her way here. Working as a professional accountant, she has held positions as controller and accounting auditor. Amy also loves artistic activities such as drawing. When we met a second time to chat and take photos in the context of this project, she was proudly wearing a beautiful dress she has designed herself and had sown for her in Côte d'Ivoire. Unlike all the people I've shown you so far, I knew Christine a little from having played a few tennis games with her after participating in the same recreational tennis leagues. It was actually her that friendly waved hello as she was walking with her dog Charlie in the Raimbault Park while I was looking for volunteers for photos. I told myself why not ask her to pose for my project. This is how I learned that she works at a business aviation services company in St-Laurent near the airport where she occupies an environment, health and safety manager position. She recently moved to Cartierville to get closer to work. She is now able to bike to work part of the year. A good portion of this trip, from O'Brien Avenue to the vicinity of Place Vertu, is today feasible via well planned bicycle routes. Still, she has all the same to cross Highway 40 by the Côte-Vertu overpass, which in the gives her 10km or so by one-way trip. Well enough to keep a woman fit! You will perhaps be surprised to learn that one can study environment in Alberta. This is what Christine did at the University of Calgary. It must be said that there are many employers in the private sector there that should be concerned with environment, whether by their free will or by social pressure. For a good ten years, she lived a traveler’s life, partly for work, but also for adventure. Thus, after Western Canada, she went to Chile to for some long hikes in the mountains. Combining pleasure and necessity, she managed to find work there as a mountain guide. It was the arrival of her daughter that took her back to Montreal, her hometown. Having been baptized in the Church of la Visitation de la Bienheureuse-Vierge-Marie, where her parents were married and where her grandfather sang, her return to this borough, where she still has family is a return to her sources.